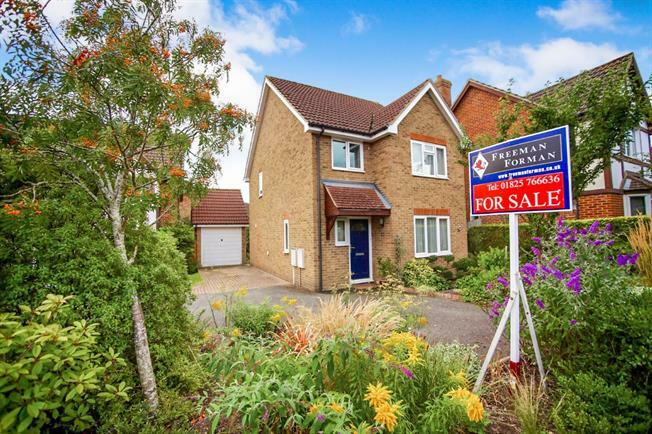 3 Bedroom Detached House For Sale in Uckfield for Asking Price £410,000. A three bedroom detached family home situated on the popular Ridgewood estate close to Uckfield town centre and mainline station. Entrance hall with downstairs cloakroom, lounge, refitted kitchen/Diner with patio doors to the rear garden. To the first floor there is master bedroom with en suite shower room, family bathroom and two further good size bedrooms. The rear garden is south facing and offers well stocked mature borders, areas to lawn and patio. There is also a greenhouse and vegetable patch. The property has been fitted with solar panels providing much reduced heating and electricity bills and this benefit will be passed on to any new owners.